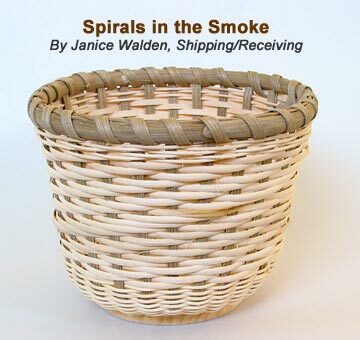 Janice created this using one of our small round slotted bases; she really likes the look of the over 2, under 1 spiral and its combination with natural and smoked reed. It was an easy basket but did require some practice to keep the shape she wanted. Sand the wooden base. Cut 27 spokes 8" long from Smoked 1/4" Flat Reed and insert the spokes evenly around the base. Soak your reed material for several minutes in warm water to make it pliable. Do not soak the wooden base. Weave about 16 rows of plain weave using natural #2 Round. Change to 11/64" Flat Oval weavers and begin this row by weaving the 1st stitch over 3 -- the remainder of this row is woven under 1, over 2, under 1, over 2, etc. Upon completing the first row, weave over 3 to begin the second row -- followed by under 1, over 2, under 1, over 2, etc. Continue weaving in this manner for about 22 rows. If the spokes want to come in too quickly, shape the basket by pulling outward on each spoke as the weaver is placed behind that spoke. Complete your weaving in the over 2, under 1 pattern with natural #2 Round (about 6 rows). Weave the final row of 1/4" Flat Smoked in plain weave. This row will be covered with the rim. Cut and tuck every other spoke to the inside. Cut remainder of spokes off flush with the top of the basket. Fit the 3/8" Smoked Flat Oval rims to the basket and trim the overlap. Attach rims and rim filler to the basket with clothespins or twist-ties. Janice used 2 pieces of Smoked #2 Round and just twisted them together for her rim filler. Lash with 1/4" Smoked Flat Reed.